Zaatar on Davie, better than Nuba? Bold title, bold statement to make in Vancouver. Nuba has been a personal favourite of mine for a while now so to find a place offering similar Lebanese cuisine seemed like an excellent chance to see if Nuba was indeed as good as I think it is. The answer is…Nuba is good, Zaatar Hummus Bar might be slightly better. This assessment is based on a one dish eating visit to Zaatar but it was damned good. 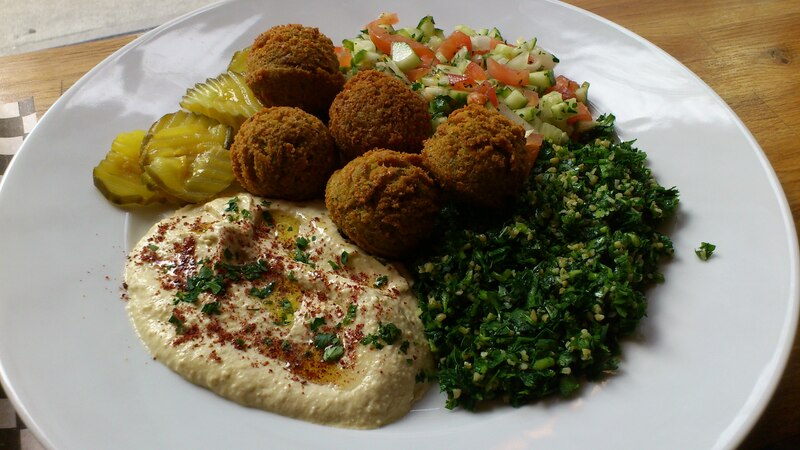 I had the Falafel Plate, amazing and very fresh falafels that were perfectly crisp on the outside but moist and soft on the inside. The Mediterranean salad (tomatoes, onion, cucumber and parsley with lemon juice, salt and pepper) was also really fresh and simple. The Tabule Salad (Bulgur, parsley, cilantro) was f**king incredible and the humus was creamy, fresh, garlic laden and a little spicy. It came with pickles (I don’t get it) and some really great pita bread. PSA – Don’t smoke crack. I have a feeling the pita bread is brought in so it’s freshness could vary depending on when they got it.